The Matrix Circuits Star*DV is a USB device that allows you to have D-STAR Digital Voice QSOs over the internet using a speaker/mike, headset or PC speakers/microphone. With the right software, you can also use it to adapt an analog radio to be able to have D-STAR QSOs over RF (for example, D-STAR on HF). The software can optionally work with a GMSK Modem to create a D-STAR Compatible Hotspot that also supports in-shack QSOs using a speaker/mike rather than a D-STAR HT. This page shows how to install and configure the StarDV software on Windows. The open source software, StarDV, was written by Rick KD0OSS of Matrix Circuits. He leveraged techniques and some code in the G4KLX suite, and some GMSK Modem code by KI4LKF. 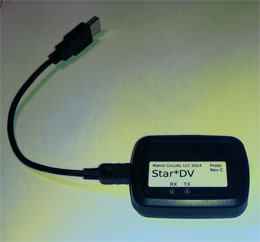 StarDV works with the G4KLX ircDDBGateway program, which manages linking and connecting to DPlus, DExtra and DCS reflectors as well as callsign routing using StarNET, CCS and ircDDB. You will be installing SDV for Windows and the G4KLX ircDDBGateway for Windows. Click here to download the Star*DV drivers (Note: if your browser blocks .zip downloads, while saving the file, replace .zip with .dat - after download, rename the file back to CDM_StarDV.zip. Then unzip the file and remember where the folder is located. If your PC is running 64-bit Windows 8.1 or later, you will need to disable driver signing. Click here for how to do that. Note: You should also come back and do this step if, in the following step, your 32-bit Windows gives you an error about "The hash for the file is not present in the specified catalog file." Plug in your Star*DV to your PC. Don't let Windows automatically try to install a driver. Instead, tell it you have the drivers and navigate to where the CDM_StarDV folder is located. The following is normally recommended, but lately Yahoo Groups has had problems, including missing files. See alternative below if necessary. Double-click on the .exe file and run the installer. Click here to download a working version of ircDDBGateway for Windows. Save to a place you can find. On the Gateway tab, normally set Type to Dongle. If you are also using the optional GMSK Modem, set Type to Hotspot for simplex, or Repeater if duplex. Latitude/Longitude/QTH/URL are optional. This info will appear on APRS status pages, if enabled, and on the ircDDB status pages, if enabled. Fill in the first Repeater 1 tab. For Band, select B or C. You will use the same value configuring SDV. Set Type to Homebrew. It’s not necessary to fill out the 2nd Repeater 1 tab. Disable the ircddb tab unless you have a gateway callsign (or “club call”), have registered it with ircDDB and they have given you a password. Alternatively, you can read the Gateway manual about using the Italian test server. If you want to link to DPlus REF reflectors, enable the DPlus tab. For callsign, fill in one that's a registered terminal at a US Trust connected D-Star gateway. Often this is the terminal with your callsign and a "blank" initial, or one with an N or R initial in the 8th position. The remaining tabs can be ignored for now, except you may want to enable the Remote tab. See notes below for more info. Go to File and select Save, then exit the program. Plug in your Star*DV to a USB port on your PC. Start SDV. You will start out on the Main tab. Initially, don't check Use Modem. Later, if you have a DUTCH*Star firmware-based GMSK Modem and want to use SDV to control your Hotspot as well as your Star*DV, you can enable that here. On Configuration Tab 2, you can change the default behavior of the PTT button and/or define a keyboard key to simulate PTT. Normal behavior is Momentary PTT is not checked, so if you are using PC Audio, you click the PTT button once to start transmission and again to stop. If you get this wrong, you could end up transmitting out to a reflector for a long time and not realize it -- you won't be very popular with other users, of course. Be sure the Star*DV is plugged into a USB port. Select a Reflector and band module, then click LInk. For testing, you may want to link to the E module of an REF reflector, which will echo back your transmissions. Speaker/Mike audio level (volume) controls -- There are two audio pots accessible on the back side of the Star*DV. The pot near the center controls the speaker level. The pot near the corner enclosure screw controls the mike level. New reflectors are being set up all the time, and some move to new servers. Both SDV and ircDDBGateway depend on "host files" listing the reflectors and their web addresses. On Windows, these are stored in the same directory as where ircDDBGateway is installed, for example at C:\Program Files (x86)\ircDDBGateway or on 32 bit Windows, at C:\Program Files\ircDDBGateway. Right-click here for latest DExtra_Hosts.txt and Save Link As DExtra_Hosts.txt "
Right-click here for latest DCS_Hosts.txt and Save Link As DCS_Hosts.txt "
Your web browser may use Save Link As, or Save Target As, or similar words. StarDV is open source software published under the GNU version 2 license. The source is available for download. Just join the stardboardt Yahoo Group and go to the Files area of the website. Copyright © 2009-2018 James M. Moen. All rights reserved.